This beanie is a match to the Men and Women's Beanie. Perfect to match up the entire family. 2. Should fit children 3 to 12 years old. 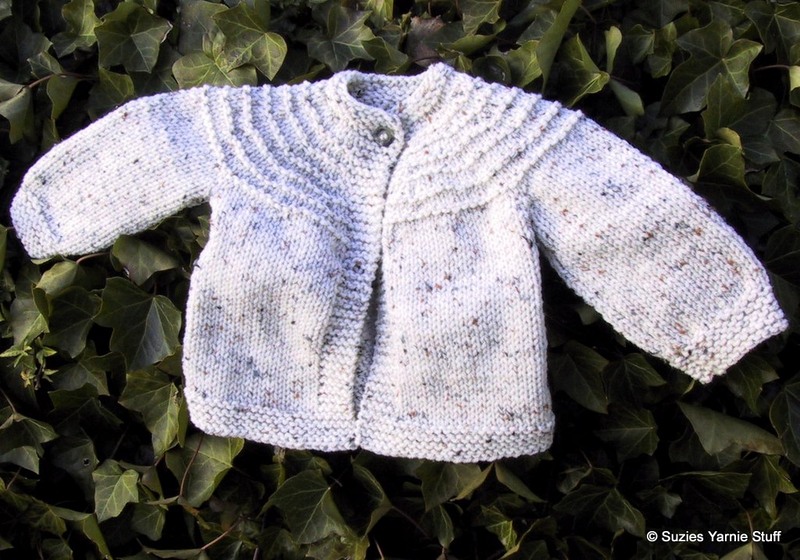 This sweater is yet another adaptation of Gail Bable’s 5 Hour Baby Boy Sweater, which was based on the 5 Hour Baby Sweater originally posted on Knit List. There are several adaptations on Bev’s Country Cottage. 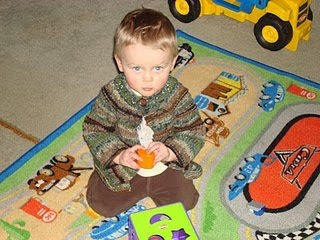 Being larger it takes longer to knit, hence the 7 Hour Toddler Sweater.. This one is considerably larger, to fit 12-18 months. 3. 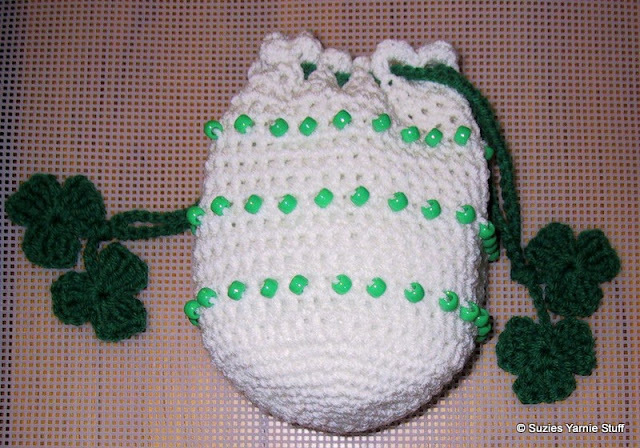 I used waste yarn rather than stitch holders. 4. There isn’t enough yarn in a multicolor Red Heart Super Saver, so either choose a solid color or buy two of the multicolor. 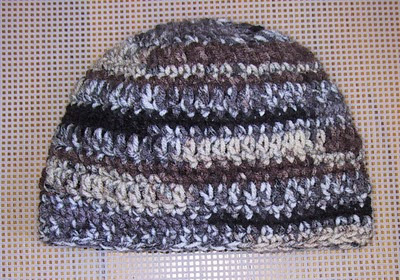 DIRECTIONS:Starting at the neck edge, cast on 37 stitches, using “knitted on cast-on”. Knit 25 sts and place on a holder or waste yarn. CO 2 sts and knit across the next 30 sts (first sleeve), CO 2 sts, Working with another set of needles and on these 34 sts, work in stockinette stitch for 30 rows. Bind off leaving last stitch on needle. With right sides together slip stitch sleeve closed being careful to close up all the holes at the underarm. Place last stitch on left hand needle. Knit 2 tog and knit across to next marker. 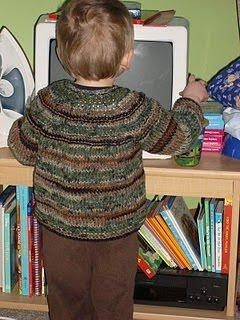 Place back of sweater stitches that you just knit on a stitch holder or piece of waste yarn. Work second sleeve same as first. Knit across remaining stitches (Body Row 1) and now work body of sweater. Weave in ends and sew on button. 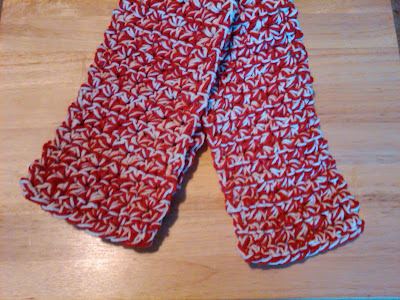 This scarf in combination with Suzie's 2 Strand Earflap Hat would make a nice set. Entire scarf is worked using two strands held together throughout. Row 4 and beyond: Repeat row 3, until scarf is ½ inch less than desired length. Last row: Sc in each st across.